All along the Mediterranean coast, the Roman empire’s richest citizens are relaxing in their luxurious villas, enjoying the last days of summer. The world’s largest navy lies peacefully at anchor in Misenum. The tourists are spending their money in the seaside resorts of Baiae, Herculaneum, and Pompeii. But the carefree lifestyle and gorgeous weather belie an impending cataclysm, and only one man is worried. The young engineer Marcus Attilius Primus has just taken charge of the Aqua Augusta, the enormous aqueduct that brings fresh water to a quarter of a million people in nine towns around the Bay of Naples. His predecessor has disappeared. Springs are failing for the first time in generations. And now there is a crisis on the Augusta’ s sixty-mile main line—somewhere to the north of Pompeii, on the slopes of Mount Vesuvius. Attilius—decent, practical, and incorruptible—promises Pliny, the famous scholar who commands the navy, that he can repair the aqueduct before the reservoir runs dry. His plan is to travel to Pompeii and put together an expedition, then head out to the place where he believes the fault lies. But Pompeii proves to be a corrupt and violent town, and Attilius soon discovers that there are powerful forces at work—both natural and man-made—threatening to destroy him. With his trademark elegance and intelligence, Robert Harris, bestselling author of Archangel and Fatherland, re-creates a world on the brink of disaster. 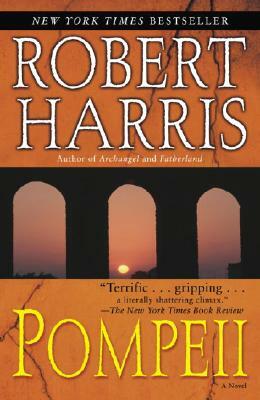 Robert Harris is the author of Enigma, Fatherland, and Archangel. He has been a television correspondent with the BBC and a newspaper columnist for the London Sunday Times. His novels have sold more than six million copies and been translated into thirty languages. He lives in Berkshire, England, with his wife and three children.